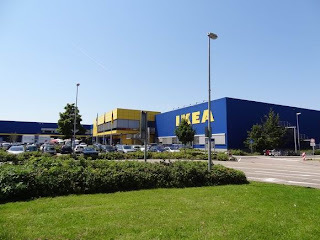 Well, as I was saying, I had my first experience at the German Ikea on Friday. If you are a frequent shopper of Ikea, then you probably know how huge and overwhelming it can be. You begin by traversing an enormous show room on the top floor where you basically take a walking tour of a thousand different little apartment rooms. During the tour, you use your nifty Ikea golf pencil to write down all of the furniture that you are interested in purchasing. If you survive the showroom, you continue down the stairs to the “small items” area where you can pick up everything from bed sheets, to lamps, to clothes hangers, to picture frames, and ceiling fans. Then, if you somehow make it through all of that, you enter this gigantic warehouse where you push roller carts up and down aisles searching for the items that you had written on your card from the showroom. These items are packed away in large boxes that are often extremely hard to lift and awkwardly shaped. Ikea construction kit...please note the beautiful rock that we substituted for a hammer!